If you’ve been on pinterest enough, I’m sure you’ve noticed there are plenty of recipes using Pillsbury Crescent Roll Dough. I’m normally not a fan of buying pre-made doughs from the grocery store, but one of my husbands favorite recipes is Chicken Pillows which, of course, uses crescent roll dough. Since I’m not obviously gonna make the dough from scratch (who has time for that?) it eventually sneaks into my fridge from time to time. 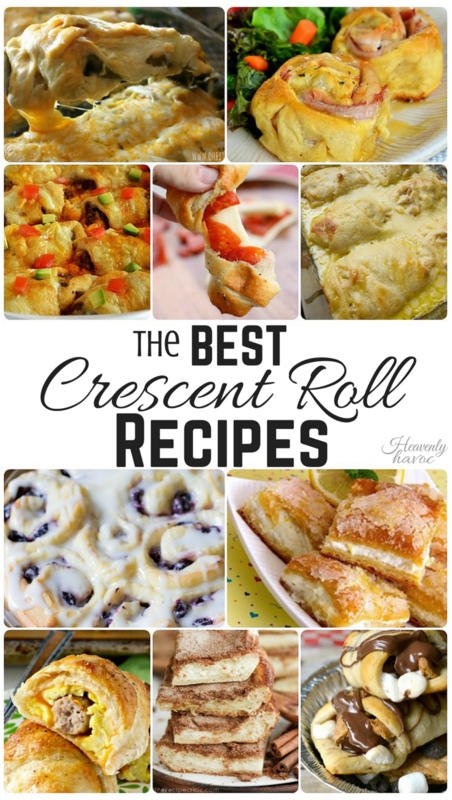 Well, since everyone seems to just be going crazy over crescent roll recipes, I thought I’d do a round up of some of my favorites that I’ve seen on Pinterest. If you have a favorite and it’s not included here, let me know! To get the recipes, click on the pictures (after the collage) to go to the original website! Whether you’re planning breakfast, lunch, dinner, or dessert there’s a crescent roll recipe for it! Enjoy! Crescent Roll Chile Rellenos by Oh Bite it! …and here’s a GREAT recipe for HOMEMADE crescent rolls for all you ambitious moms out there!